MomsRising.org | URGENT: Protect Paid Sick Time in Michigan! URGENT: Protect Paid Sick Time in Michigan! 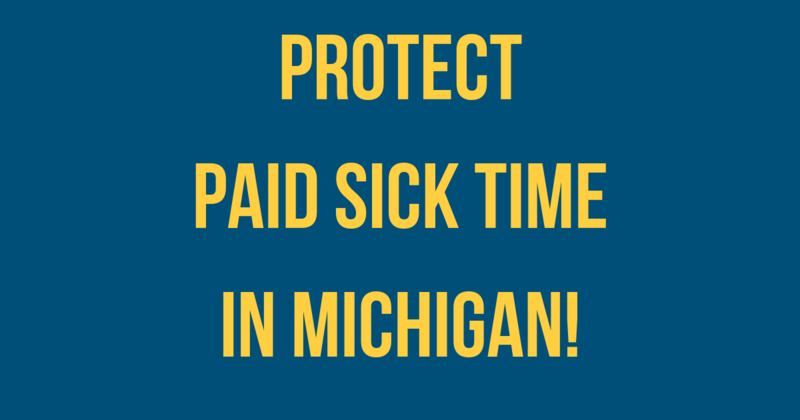 Urge the Michigan Legislature to protect — not gut — the new paid sick time law! Legislators have officially introduced a bill that would amend Michigan’s new paid sick time law, so we know their intentions to weaken the law are a very real threat. It’s time to double down! Tell the Michigan Legislature: PROTECT – Don’t Gut – the new Michigan paid sick time law! Right now, the new law is slated to go into effect by April of 2019, allowing employees in Michigan to earn up to 9 paid sick days a year, depending on employer size, to care for themselves or a sick loved one or deal with the aftermath of domestic or sexual violence. I ask that you protect Michigan's new paid sick time law and reject the bill that was introduced to amend the law. Paid sick time helps working families stay afloat and helps businesses stay healthy and productive. It would be unfair and unproductive to have passed the law, only to gut it later. I'm counting on you to PROTECT paid sick time!